I don’t know how or when it happened. But somewhere in the past, I don’t know, 35 years, racing became cool again. 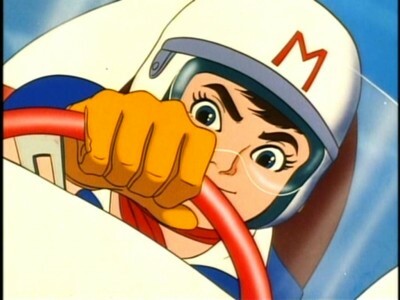 Okay, maybe I’ve just always been a girly-girl who didn’t realize that racing is, infact, cool, but when I was in my teens working in a video store and the manager put on his fave-from-childhood anime (Japanese cartooning which was SO far advanced) Speed Racer, I just wasn’t into it. Fast-forward 18 years, I’m home with a sick 4-year-old and on on-demand we can get Speed Racer shows. So, we watched. Again. And again. And again. Anime is still impressive. And, suddenly, I’m into it. And so are my sons. Eleven months later we’re still Speed Racer obsessed. My now five-year-old was Speed Racer for Halloween. In all, there were 52 episodes and if you aren’t familiar with them you can read the details at DVD Talk, which gives an awesome review of the series (with spoilers, though.) It was a non-violent (in terms of fighting– I mean, if a car goes off a cliff, well, it crashes, right?) TV series of a boy (that’s Speed Racer) who only wants to race his hot car in the grown-up world, but needs to impress his beloved father and big, racing brother along the way. What’s so cool, and what I really think draws my boys in, besides the goal of race car driving (the same dream their daddy had and finally got to live last year at Lowes Motor Speedway) is the way that Speed Racer drives. Observe your guys racing their Matchboxes around the house with filps, slants, rolls, even upside down … that’s how Speed Racer can drive. He’s making every little boys’ dream an animated reality. The 2008 special edition set comes in a tin-boxed Mach-5, with a bonus CD, in addition to the complete series. The series will instantly be a favorite. Retailing for $49.98, Amazon is listing it at $35.99 with free shipping, as of this writing.